I was flattered to be invited as a guest speaker at the Houghton College Fine Arts Seminar in upstate New York. Students, where faculty and community members attended the presentation about my illustration career. It was such a warm reception and boost to my creative ego! The Houghton art faculty were so influential in my own undergraduate journey (over 15 years ago! ), it was certainly rewarding to reflect on my evolution as an artist. It’s always exciting to hear a Houghton art major success story, and Erin Banks’ story was even cooler/weirder than the norm for me personally. My family used to subscribe to Focus on the Family’s “Clubhouse” magazine, which Erin has done illustration for, and I am pretty sure that I’ve seen her work in issues that might even now still be floating around my house. It was a little bizarre to meet her, and hear about her practice and work since Houghton, but really great at the same time. Erin studied graphic design at Houghton, graduated in 2000, and went straight to getting her MFA in illustration at Savannah College of Art and Design. She was interested in the fusion of traditional and digital media while at Houghton, but decided to revert to using only oil paint in grad school. She’s been working in oils ever since, to illustrate everything from financial magazines to children’s books. The thing I love most about Erin’s work is how unique and immediately recognizable it is. She uses a limited palette for each piece but always has incredibly vibrant colors, not even including the vivid pink underpainting that she leaves visible as a bright outline around her figures. 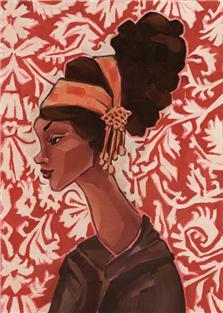 She paints with angular, geometric shapes and is not afraid to exaggerate certain aspects of her figures (as seen in the neck of the “Paisley Lady” above) to accentuate her style. Because of this style, as well as the pink underpainting (which I really, REALLY love), her work always seems to have a lot of movement and looks very alive and exciting. I know nothing about my future, but I do know that I am an artist, and that I am passionate about the work I do. It doesn’t sound like a lot from where I am right now, facing my imminent ejection into the “real world,” but if such a huge Houghton success story tells me that’s enough for now, who am I to argue?